This is the easiest way ever to do a trade show booth, using three retractable banners to form the backdrop. We make three retractable banner stands with graphics that work when split into three vertical sections. Note how this trade show booth is set up so that the spaces between the retractable banners really don’t get in the way of the message. Doing a trade show this way is affordable, too. If you use our premium banner stand, you are spending less than $1400, and if you use our economy banner stand, under $700. 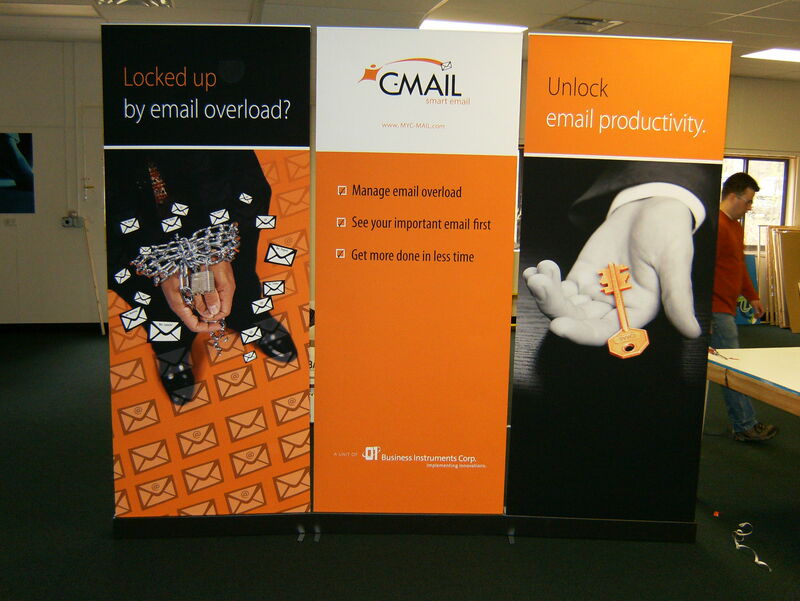 You can also carry these retractable banners into the show, saving the expense of having them delivered to your booth. You can set them up yourself, saving union labor. Best of all, you can do it in a short time, usually less than a half hour. If you are getting to town late, you can show up an hour before the show starts and be ready to rock and roll when the whistle blows. Retractable banners are all over the shows that I go to, and for good reason! This entry was posted in Retractable Banner Stands and tagged retractable banners, trade show banners, trade show graphics. Bookmark the permalink.